Brunswick’s back, alright…and it’s not as you once knew it. Gone is the ‘sports club’ theme, the jerseys, the memorabilia and the AFL locker room styling. This is a tale of two venues and a game of two halves… read on to see if we think this underdog has a chance to top the table. The transformed Brunswick Eatery, Bar & Terrace now feels like a cosy neighborhood joint you might find in one of Auckland or Melbourne’s trendier suburbs. It’s even got a terrace now, as the name suggests, and one that felt pleasantly cool on a hot summer’s evening – much to our surprise. It’s quite the novelty to dine alfresco in Dubai in July and not be sweating up a storm, so this also felt very-un-Dubai-like, despite the eatery being attached to the Mall of the Emirates by way of the Sheraton MOE hotel (this means it has a license, folks – hooray!). 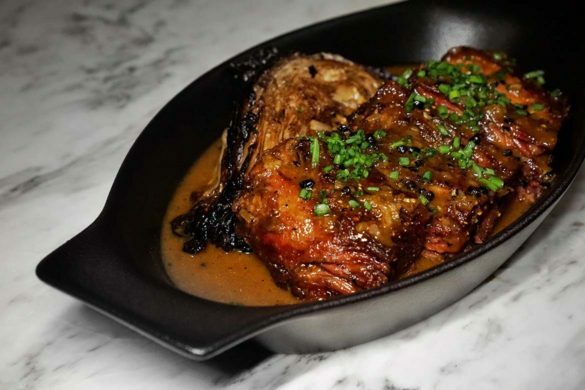 Apart from the decor, the first thing you notice about the revamped Brunswick is that the new menu feels much expanded from the previous sports bar ‘beers with the boys’ style offering. Don’t worry – there’s still a big burger or three on the slate if that’s what you’re looking for, but the new menu is much more creative and refined, with a lot more choice. 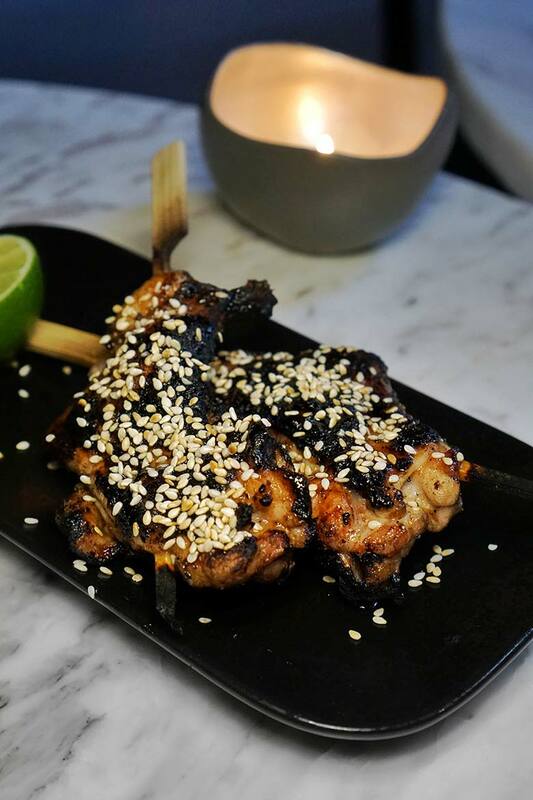 We kicked off proceedings with a couple of their new bar snacks – Turmeric spiced tempura cauliflower, fried curry leaf and rasam mayonnaise (30dhs) and the Habachi chicken wing skewer, baby leek, sesame & tare (that’s a soy basting sauce, thanks Google) (45dhs for two). 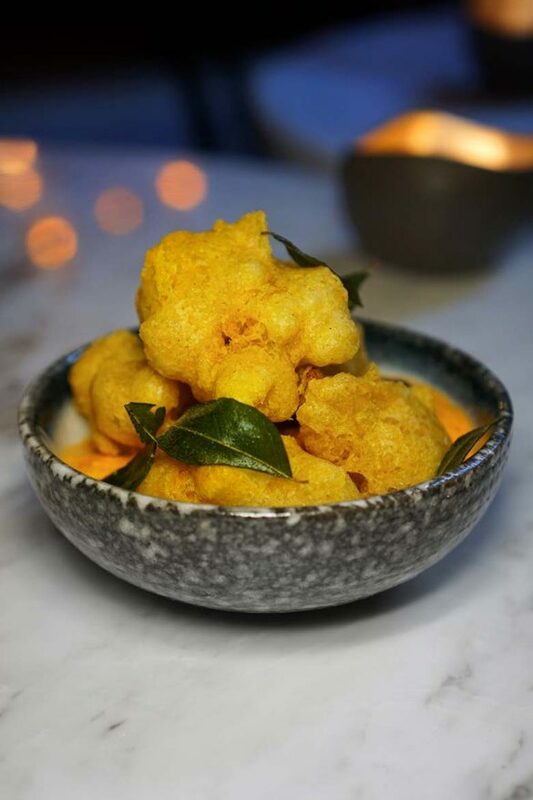 The curried cauli is a winner (that mayo is delish) though we’d like to see it cooked a little less before deep frying to give it a touch more bite. The Hibachi chicken wings showed great promise as they were juicy and tender, but unfortunately ended up being far too salty to enjoy and were also missing the baby leek as described in the menu (the reason, I’m told, is that simply they didn’t have any leek). I’d have loved some tasty Japanese mayo alongside the skewers for dipping too. The medium plate section follows on from the smaller bar snacks and with two of my favorite proteins on the menu I just couldn’t go past the quail and the steak tartare. The Grilled quail, tamari, yuzu, mustard, coriander and pickled chili (130dhs) delivered some of the finest quail meat I’ve eaten – not a bone in sight and surprisingly juicy. 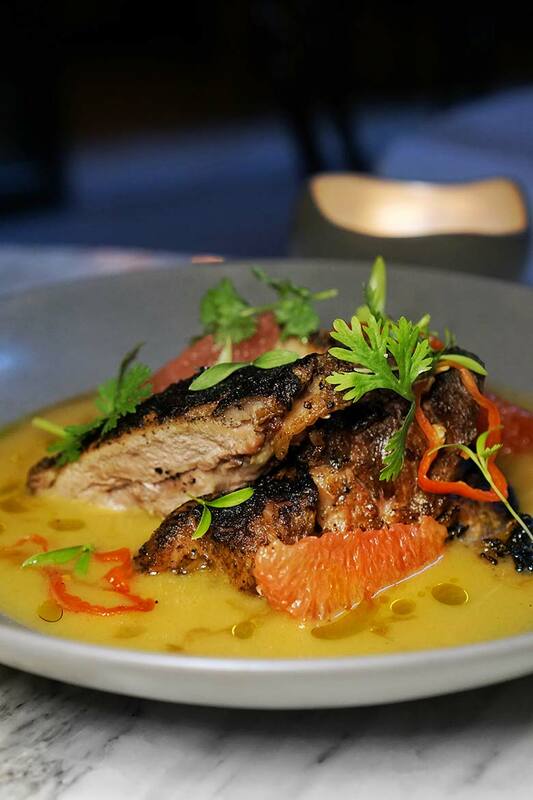 The very intense citrus sauce it was swimming in however needs dialing back, the citrus factor and surprise ruby grapefruit addition being much more dominant on the plate than the menu description. It was also so fiery it had my lips tingling – so unless you like your chili hotter than hot, this might not be for you. With a few tweaks when it comes to balance and intensity (less citrus, a touch less heat and more coriander and cooling veges) this could be a really great dish. 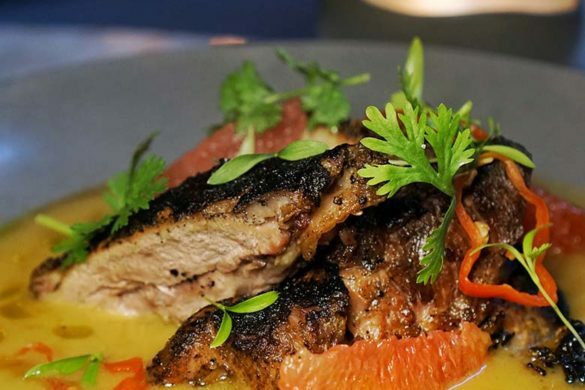 Quail isn’t easy to work with so to see this style of eatery taking it on is to be commended. Our Wagyu tartare, sherry vinegar gel, cornichon, quail yolk, parsley oil and sourdough crisp bread (92dhs) was a tad heavy on the sherry vinegar and cornichon and could have benefitted from a finer dice to show off the wagyu to a better degree. 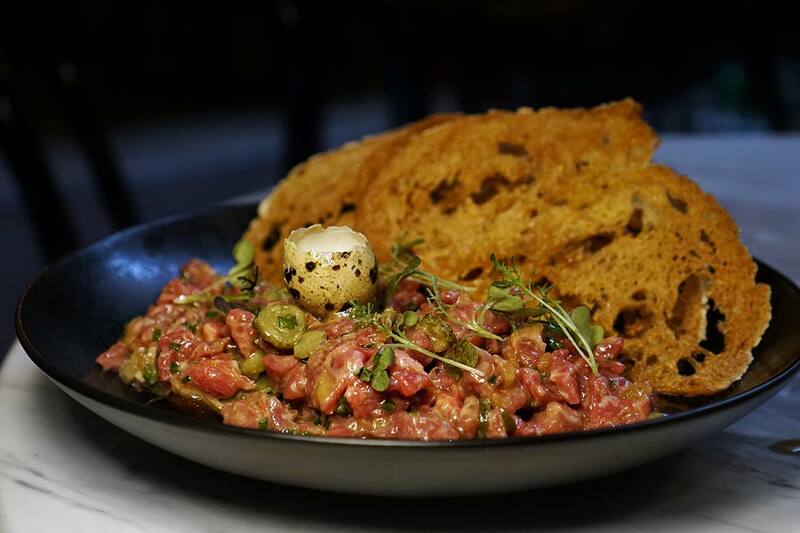 Don’t get us wrong – it’s not a bad dish overall, but it needs a little more balance and finesse to compete with similar dishes that are priced at the same level at Dubai fine dining establishments (by comparison, Celeb chef Michael Mina’s Mina Brasserie’s steak tartare comes in at 95dhs and is executed to a much higher standard). At the half time break in our meal, one could say it was a slightly rocky first half from the Brunswick team, but still one that showed a lot of promise and potential. The second half of the meal, however, was really where the Brunswick started to shine. Our Slab cut wagyu pastrami, cabbage & au poivre sauce (160dhs) was succulent and juicy with crispy bits in all the right places – and a good serving size too. The accompanying cabbage was also a winner, and our choice of salad accompaniments really made the main event of our meal a home run. 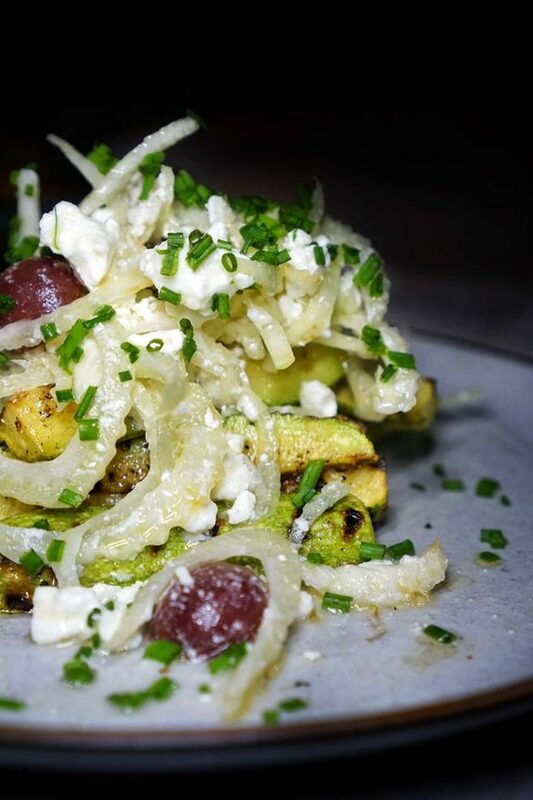 The Grilled courgette, pickled grapes, feta and fennel (58dhs) may just have been the dish of the night, and the Endive salad, ruby grapefruit, chives & Dijon dressing (55dhs) also had the table singing its praises. This trio of dishes was at once hearty, fresh and seasoned perfectly. We’d definitely return for these well-executed plates. We left just enough room to sample the Brunswick’s desserts, of which surprisingly, there are only two listed (and one takes 25 mins to prepare we are informed after ordering, which we’d like to see noted on the menu). 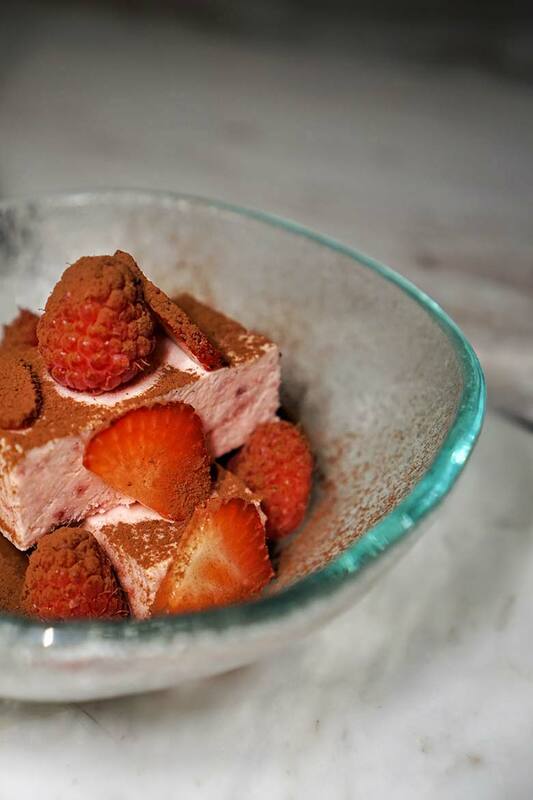 Whilst we’re not over the moon about the wait, thankfully when the desserts do arrive they are absolutely fantastic. I’m not normally a fan of the sweeter side of the menu, but these desserts, while sounding like seemingly obvious combinations, impressed more than almost desserts all I’ve tried in Dubai recently. If you want some serious comfort food indulgence, look no further. The Raspberry semifreddo, bitter chocolate & lemon balm (45dhs) offered up all the tastebud-pleasing goodness one could want from the classic combo of berries and chocolate (the menu-listed lemon balm, which seemed out of place, thankfully was no where to be seen). The Peppermint crisp soufflé, chocolate sorbet & peppermint custard (45dhs) was the dessert that needed the extra time, but once it arrived we all decided it was well worth the wait. Lovers of mint chocolate chip ice cream, you’ll die and go to heaven eating this dessert (though you’ll probably want to share, it’s extremely indulgent)! 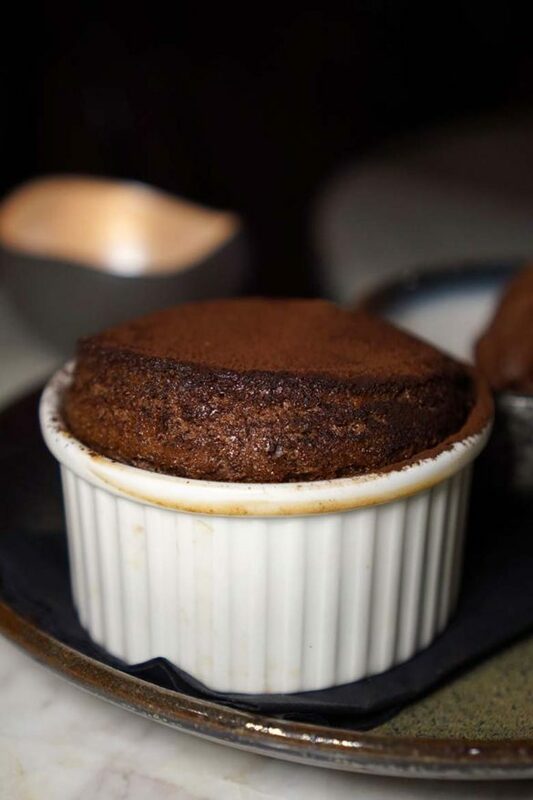 Dubai loves it’s gooey chocolate desserts and this is a contender for the best in town. It’s a bit of a mixed bag on the beverage side of the equation too. There are some great happy hour two for one offers on the terrace, with an interesting wine selection by the glass. We’d like to see the wine service improved with better glassware for these lovely wines and wines poured in front of the customer (no-one likes surprise wine) but we think this will come with time and a little training. We’d also like to see the cocktail list expanded as it’s mostly classics (and our usual espresso martini didn’t hit the mark). You’ll find a decent range of beers offer though and Brewdog Punk IPA on tap. Service was a game of two halves also, starting off in a slightly disappointing fashion. Lots of basics seemed missing – water not poured (and strangely only 500ml sized water on offer), as mentioned earlier, wines poured out of sight of the table (a pet hate of ours), spoons not provided for any of the dishes that needed them, no glasses offered for bottled beers etc. Not huge issues, but just little boxes that one expects ticked at these prices. After a change of server later in the night, the quality of the service definitely improved – much more professional and attentive with more attention to detail. A terrace and a license attached to MoE? Always a bonus!